The old Liberal club in Hawick is one of the properties expected to benefit from a forthcoming conservation area regeneration scheme. Scottish Borders Council has already been awarded £1.3m by Historic Environment Scotland to fund the scheme and is now hoping to see that topped up to just short of £2m. It had initially intended to add £157,000 to that kitty in the hope of landing a £1.41m grant from the government agency but instead will have to pay out an extra £42,300 to secure £1.3m. Factoring in private-sector contributions of £358,750, the project will have a budget of £1.93m to go towards restoring shopfronts and historic buildings in the town centre. A report by the authority’s chief economic development officer, Bryan McGrath, asks councillors to approve the extra match funding contribution. It reads: “Officers from Historic Environment Scotland indicated that they were supportive of the proposal but highlighted that the grant request of £1.41m was considered high given the scale and impact of the proposed scheme. “The council had committed to providing £157,700 of match funding from existing revenue budget for the proposal. “Historic Environment Scotland officers recommended that further match funding should be sought, if possible, in order to strengthen the application. “Recognising the potential impact that the Hawick proposal could bring to the town centre, including match funding from Historic Environment Scotland and private-sector contributions, officers provisionally agreed to contribute an additional £42,300 of funding. “It is proposed to contribute a total of £200,000 – £40,000 per annum – from the council over the five-year period of delivery for the Hawick Conservation area regeneration scheme proposal. A similar scheme has already been completed in Selkirk, seeing £2.4m public-sector funding invested in the town between 2013 and 2018. Over that period, the number of at risk buildings in Selkirk’s town centre was reduced from seven to two, average footfall rose from a low of 2,090 to 2,710 and the percentage of vacant shops was cut to below the regional average. Hawick, on the other hand, has seen a marked deterioration in its town centre. Average weekly footfall has declined, year on year, from 9,990 in 2008 to the current level of 4,680, and the latest retail audit in December 2017 showed there were 37 vacant units in the town centre. 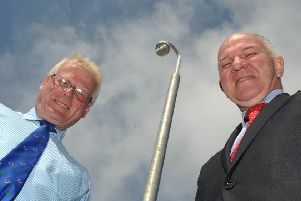 Kelso has already benefited from a similar scheme and one is currently operational in Jedburgh. Properties in line to be renovated in Hawick include the Crown Business Centre at 20-22 High Street, the former Queen’s Head pub at 32 High Street, the erstwhile Liberal club at 80 High Street, the old KT Krafts shop at 24 High Street and the vacant Beauty Lounge unit at 26 High Street, as well as 4 Round Close. Members of the council’s executive committee will meet on Tuesday, April 16, to discuss the proposed additional investment.